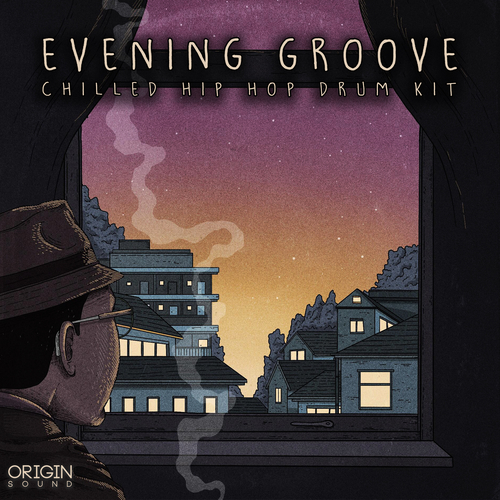 Origin Sound are proud to present Evening Groove – Chilled Hip Hop Drum Kit. A special library of exquisitely produced chilled hip hop samples, suited to all styles of hip hop and soul. Evening Groove – Chilled Hip Hop Drum Kit’s primary asset is a diverse range of expertly stylized drum hits. Start with our 20 kick drums, which have been manufactured with a unique character fitting for hip hop of all styles. Our diverse 20 percussion hits and 20 tops are crafted with care to be easily dropped into your project, ranging from dusty wooden hits to bright sizzling live cymbals. Lastly, a further selection of 20 brilliant snare drums provide the perfect drum sample library to achieve a truly authentic percussive character in your mix. If you prefer to work with pre made loops, then you’ll want to explore our folder of exciting and detailed drum loops, packed with soulful grooves and tight, precise rhythms. In this folder there are 24 primary full drum loops, as well as accompanying renders exclusively just kick and snare or exclusively just percs and tops. If you’re still after more sounds to play with, we have included a bonus folder of 16 perc loops, which are ideal for providing that extra layer of detail in your drum tracks. Evening Groove – Chilled Hip Hop Drum Kit also comes with a large “construction kits” folder. Enclosed are 4 sub folders containing the dismantled audio to 4 different pre-made professional demo tracks. Among each track are drum, SFX, bass, keys and synth stems, each with guaranteed crisp and clear audio quality, allowing you to seamlessly drag the sounds into projects of your own, inspiring new ideas and adding extra depth to your productions. As well as additional unique stems for each kit, we provide a “Full Mix” file as a reference for how the files are assembled into a complete sonic product. “Evening Groove” is one of our more unique packs, focusing especially on sound deconstruction and how this can make your music stand out from everyone else.